Did I mention we are doing this in two weeks’ time? Last week I caught up with a friend who hadn’t seen me for a while. Most of my time and energy were focused on caring for my mother and myself. Good friends understand this and are fantastic at picking up right back where we left off. She took one look at me and remarked how peaceful I looked. This was so encouraging to know that others saw outwardly how I felt inwardly! It is true. While we have had significant turmoil, the winds have not knocked me over. 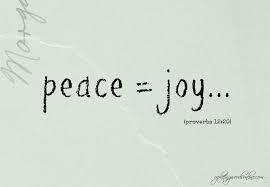 I have peace, which produces joy,which comes when I place all of these things before God. Is that easy to do? No. Is it tempting to take back ownership of problems I can’t fix on my own? Every time. My hope, my confidence, my purpose – that all belongs to God. What a relief! Do you have issues or strongholds you are carrying that you need to hand over to God?